Following an exercise switching some of my actively managed funds into passive funds, I said at the end of this post that I wasn’t going to tinker with my portfolio any more. The allocation mix of my portfolio was heavily biased towards UK equity, so I’ve done some rebalancing (switched funds) to start addressing this. I think I should be pretty close to my target allocations in a few months or so. Still missing investment in the ‘Developed World Value’ section but this should be sorted soon when I start investing in Vanguard World High Dividend ETF (VHYL). Actively-managed funds now only account for 23% of my portfolio, so I’m more or less in my ‘passive-investing zone’ now! Although since I ‘actively’ choose which funds to invest in each month, am I truly being a passive investor? Guidance suggests that portfolios are rebalanced just once or twice a year but since I choose which funds to invest in each month, I appear to be going against the grain in that I’m going to end up rebalancing pretty much every month. I’m not going to be timing the market or buying whatever fund is flavour of the month, or selling funds to rebalance. 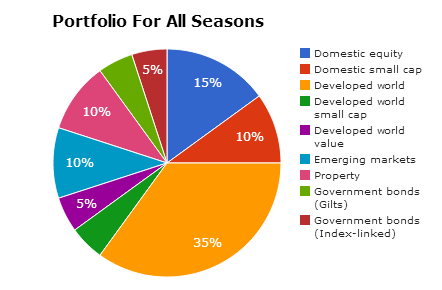 I’ll just be buying more of my existing funds to make the numbers match my Portfolio For All Seasons. For example, this month I’ll be investing more into BlackRock Global Property Securities. Equity Tracker and BlackRock Emerging Markets Equity Tracker to increase their respective allocations (Property and Emerging Markets). Next month, it could be two different funds, or the same again. Is it possible to rebalance too much? Hi Weenie, I'm in a similar state, have moved from actively managed funds to passively managed low cost trackers…..then decided to rebalance a bit more. I think I've got my investments where I want them now, and monthly savings set up in the right percentages to maintain it. But I've yet to read Tim Hale, and I think after I read it I'll have to do another re-org. So yes, I think you can rebalance too much and I'm going to try and take more of a backseat approach, automate and only check up on balances each month going forwards. Hi GFC, I thought I was happy with my investments until I'd read Tim Hale! At least I wasn't totally in the wrong! As regards to rebalancing, I'll only be doing it once a month, just before my direct debits going out or before I make any adhoc payments. I'll see how that works. Thanks for stopping by! Hi weenie, I would say that getting your portfolio into proportion according to your plan is essential and if you're not paying trading charges to do it then I wouldn't worry too much. If you're adding money every month it's only sensible to do an assessment of how things stand and where it should go. Hi Cerridwen, I agree – right now, getting to my plan and then keeping to it is essential. I'm surprised myself at how much progress I have made. What Tim Hale taught me was to get rid of emotion – can you believe I was actually 'attached' to some of the funds I had, probably because they were the first ones I chose myself! Anyway, I chucked emotion out of the window and shifted the funds in accordance with my plan! Hi Weenie, having a plan is the main thing. You are shuffling the %ages around but once you get them settled you will find you start to let them tick over without having to concentrate on them so much. Short term pain for long term gain. I need to sort out my ratios as I have too much based in UK funds. Perhaps I should read through Tim's book based on your great review. It would help me to formulate a plan and get my act in order. You are making great progress and learning a lot along the way which is part of the experience. Hi sparkleb33, yes, I think short term, I'll be shuffling the percentages but things should settle down in the long term, so I'll just carry on doing what I'm doing! Thanks for the kind words and thanks for stopping by! Thanks for sharing your plan with us all. At the moment, I only have 3 funds I invest in (all with Vanguard) so haven't even thought about having to re-balancing them yet. I want to invest in a couple more in the not too distant future but not too sure of which funds to select. Hope you don't mind me asking but how do you go about selecting which funds you invest in? Where funds were mentioned, I compared these with other funds and have ended up investing in some of the ones recommended, eg the Vanguard ones. Seems like you already know what you're doing with your Vanguard funds – I'd never heard of them previously! Anyway, I've used my own % allocations, decided not to invest in commodity as suggested by Monevator/Tim Hale and of course, still have a few actively managed funds, mostly in UK equity. They seem to be doing ok now and I can always switch them later if I wish. Thanks for the link, I must have missed that one off the monevator site!